For the most part, the "performance enhancement" for your ETX or LX 90 scope is now complete as far as the telescope goes. You have remedied mechanical shortcomings and you have followed a sequence for download/reset/initialization that leads you to TRAINING THE DRIVES. From here on out, the entire success of your sky searching and tracking proficiency is ENTIRELY UP TO YOU! You are in control....any problems at this point and we chalk it up to "User Error." For this final section, I want to walk you through the process of very precise TRAIN DRIVE procedure, followed by determining HOME POSITION in both Alt-Azimuth and Polar configurations; although there is much said about this on the web site and some in the Meade instructions, there are still some guidelines and helpful hints to "let you do it better." We are, after all, after PERFECTION. IMPORTANT! You should always train the drives in the configuration you plan on using your scope in THE MOST, whether it be Alt-Azimuth or Polar. Referring to Figure 2-c in the previous section, you must first select TELESCOPE/MOUNT/....and either "Alt-Az" or "Polar." Press enter and THEN SCROLL to "Train Motors." This increases the ultimate slewing/tracking precision of both drive trains. 1) Before initializing to train the drives, make sure in either mode that your clamps are fully engaged for accurate movement of the motors and telescope during the training procedure; failure of the clamps to hold tight will result in lack of anticipated movement by the AutoStar and hence, failure to result in accurate motor training. 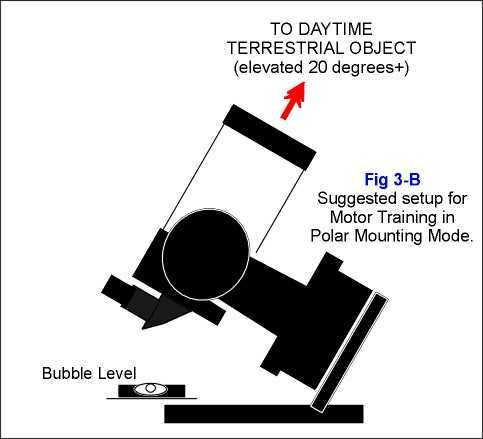 2) ALSO IN TRAINING IN BOTH MODES - always find your object (a distant elevated terrestrial object for daytime POLAR training [Fig 3-B] and the north star POLARIS for ALT-AZIMUTH [Fig 3-A] training at night) wit LOWEST magnification first and center in the main telescope; gradually increase the magnification until the HIGHEST MAGNIFICATION is achieved and continue to center the object dead center each time. A reticle eyepiece greatly assists in the centering process for "Training", but is not necessary. 3) REMEMBER in "training" that AutoStar will move the telescope FIRST in two opposite ALTITUDE directions and indicate an "Arrow" key to push to re-center the object after each move....MAKE SURE that you use the LOWEST PRACTICAL slewing speed ("2" if possible) to re-center the object once moved. This is because you ONLY HAVE ONE CHANCE to center....if you OVERSHOOT the target (too much past center) you CANNOT REVERSE in "Training" function! 4) A common mistake by many users that I have talked with is "Training Azimuth TWICE." This is easy to do, and many times is resulting in some of the AutoStar oddities that we are seeing out there. Here's how it works and how to remember to NOT do Azimuth twice in a row! b) first to appear will be "Az. Train", so press enter at which time the telescope will move slightly in one azimuth direction and prompt you to "center"; do so and press "Enter"
d) HERE'S WHERE people are making easy mistakes! When you press "Enter" after the second Azimuth slew centering, rather than DEFAULTING TO THE NEXT PROCEDURE (which would be to "Train" in Altitude, here is what shows up on the screen: "AZ TRAIN" just like before; IF you hurriedly hit "enter" you will be RE-TRAINING in Azimuth, NOT starting what you SHOULD be doing, which is TRAINING ALTITUDE! e) so, instead, when the "Az Train" prompt comes up AFTER you have already done so, use the SCROLL key down one step to "ALT TRAIN" and press enter; again it will begin slewing in one direction first in altitude and ask you to re-center the object and then repeat in the opposite direction. You would be surprise how many ETX and LX 90 users out there have a double Azimuth training, but NONE in Altitude because of this misleading prompt! 5) IMPORTANT - BEFORE COMMENCING training, be sure to Mode to "Setup/Telescope", select "Telescope" and scroll down to "Mount" and select. Then, under "Mount" scroll down to "ALT-AZ" and/or "POLAR" and select whichever one you plan to observer with! by pressing Enter when that function is on the TOP line of the AutoStar screen. You are now ready to "Train Motors" for your respective setup (i.e., either Polar or Alt-Az), a very, very important process that will assist in greatly enhanced performance of your telescope in its computer capabilities. If you DO NOT train properly and very deliberately/precisely, then you cannot expect the ETX/LX 90 and AutoStar to do what Meade claims it will do (and it will do it if all is set up properly!). Training in Alt-Azimuth mode can actually be more accurate than training in Polar mode, even though in my opinion the overall tracking/slewing performance in Polar is ultimately superior. HOWEVER, remember that if you plan to use in POLAR MODE, you must TRAIN in polar mode! In the Alt-Azimuth configuration training is highly accurate and much easier by using the bright north star, POLARIS as your training object for a couple of reasons: NOTE: NEVER USE POLARIS FOR "POLAR" MODE TRAINING....USE A DISTANT AND ELEVATED TERRESTRIAL OBJECT! 4) Terrestrial objects are subject to "washout" at high magnifications and at low angles; this presents a fuzzy and vague image of the tiny detail you wish to center each time (i.e., an insulator atop a distant electrical pole). Figure 3-A demonstrates clearly the position of your ETX or LX 90 telescope and base for training purposes; note that this is NOT "Home Position." Be sure and take your time....do the training using the overall steps above and you will have much success in matching the AutoStar recognition to your drive train. The results will be worth the time and effort. 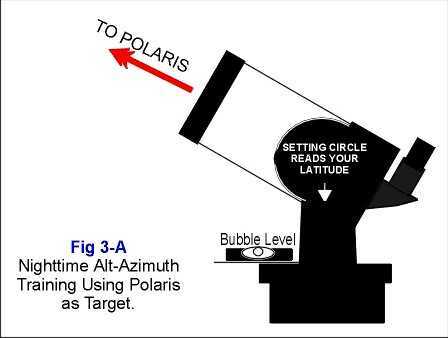 Polar mode training should be always done in the daytime for convenience and ease; NEVER use Polaris as you would in Alt-Az training since the AZIMUTH train procedure would result in little perceptible offset when moving the telescope for the procedure and thus result in VERY poor motor training. Figure 3-B demonstrates the proper orientation (ideal position shown) for POLAR MODE TRAINING. You may not be able to reach the high altitude demonstrated in this drawing, but certainly lower to access the best object. Other than the time of day (or night) and the telescope orientation, there is little difference between Polar and Alt-Azimuth motor training. JUST REMEMBER, that if you are going to train in Polar and use in Polar, be sure to default AutoStar BEFORE "Train Motors" to "Polar" mount function (default is set on Alt-Az and must be changed). IMPORTANT NOTE: It appears in the latest versions of AutoStar that, if you CHANGE THE DATE of AutoStar initialization after the very first setup, the selection of "Polar" mount configuration WILL NOT be defaulted to on subsequent dates; in other words, if you kept entering "May 12" as your date having already reset AutoStar to "Polar", then "Polar" would be maintained as your mount configuration of choice. HOWEVER, once you key in tomorrow's (or any subsequent) date, the AutoStar automatically defaults BACK to "Alt-Az". This is a common and CRITICAL error by many users by not CHECKING before alignment each night, what mount configuration is selected in AutoStar....get into a habit of doing this BEFORE any alignment procedure even begins! 4) Your slewing/tracking seems so far off that you wish to routinely "Reset" and retrain to start anew. If you are having "Motor Unit Failure" or just odd behavior in the motor function, always attempt a "Calibrate" function BEFORE going through the rigors of motor re-training. The motor calibration function will allow "syncing" of the motors quickly and a re-train may not be necessary. 1) You DO NOT need to retrain if you change locations. HOWEVER, if you have several locations (up to five) keyed into AutoStar with exact latitudes and longitudes BE SURE to "SELECT" the exact location you are observing from to increase the GO TO capability of AutoStar! 3) If you CLONE AutoStar containing you latest "Motor Train" to another AutoStar, the newly-clone unit MUST be trained to the telescope it is to be used on. If the second AutoStar is to be used with the SAME telescope, there is no need for re-training. 4) As stated above, you MUST RETRAIN after every AutoStar upload or every "Reset." 5) If you choose to change, via the new "Azimuth Percent" and "Altitude Percent" AutoStar function (Part 2), you DO NOT need to re-train the motors to AutoStar. 6) If you decide you want to change from, say Polar to Alt-Azimuth mount configuration permanently, YES, you should RESET and re-train the motors; be sure to go into AutoStar and select the new mount choice as well! 7) Alternately, if you are using, say Polar mode and want to just do a "quickie" outside in Alt-Azimuth configuration, you SHOULD NOT retrain the motors; however, for proper tracking you would still have to default AutoStar into the "Alt-AZ" mount function. This final section demonstrates some of the most common causes of mistakes and mis-slews that result in poor tracking/slewing/GO TO operations. Putting the telescope in "Home Position" and then subsequently properly "Aligning" are the two most crucial steps to accuracy and enjoyment of your ETX or LX 90. Curiously, these are the two that are most prone to "user error" than anything discussed until now! So let's do it RIGHT the first time! You have spent all this time checking for and correcting mechanical problems that prevent accuracy, and you have properly installed and re-initialized and trained the AutoStar to sterling quality, now let's get that telescope set up correctly and you "have ignition!" Starting with "Home Position," this is perhaps the most critical step to success; you must START RIGHT to END RIGHT as they say. It is very important that you start in this position EVERY TIME you take your telescope outdoors for observing; failure to do so will result in disastrous tracking and possibly even damage to the telescope motor units. For the most part it is far easier to attain "Home Position" in the Alt-Azimuth mode than in Polar, hence why the majority of ETX and LX 90 users prefer that configuration; if done correctly, the telescope will function adequately in either mode, although POLAR is preferred for photography and long-duration high powered viewing. Figure 3-C demonstrates the correct orientation for the ETX or LX 90 to achieve Home Position. 2) Orient the telescope and mount (tripod or table) so that the CONTROL PANEL (that which the AutoStar plugs into) faces WEST. 3) Using a bubble level, first attempt to level the flat "turntable" (that top plate of the mounting that has the azimuth clamp in it) in all directions as best possible; some variations can be expected, but do the best you can. 4) Now unclamp the azimuth and rotate the telescope COUNTERCLOCKWISE all the way to the hard stop, and back CLOCKWISE until its fork arm with declination circle is OVER the control panel and the optical tube assembly faces near NORTH; attempt to do a dusk or nighttime so that you can see Polaris if possible! 5) If Polaris is visible, unclamp the ALTITUDE axis and rotate the telescope in both axes to center the star in the telescope; this allows you very VERY accurately reckon very close to true north; once Polaris is centered, LOCK the azimuth axis and rotate the telescope downward again to near-level - your telescope is now pointing north and near true "Home Position." 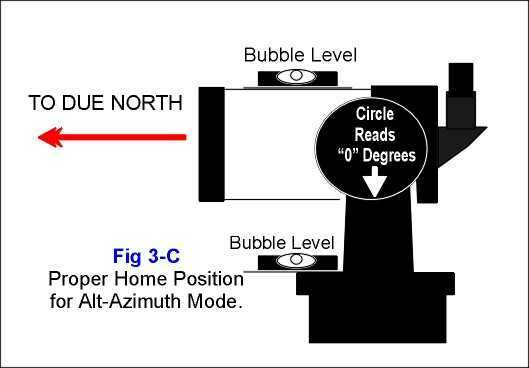 6) At this point, DO NOT CHANGE the azimuth position; leave securely clamped; using bubble level, level the OTA carefully as shown in Figure 3-C and clamp the Altitude clamp securely when the OTA shows perfectly level...DO NOT rely on setting circle at this point! 7) Once level, now check your setting circle; if set correctly, it will read "0" degrees; if not, then gently turn it (you may have to unclamp the knob in front of it a bit) until it does read that setting. YOU ARE NOW IN ALT-AZIMUTH HOME POSITION and ready to align your telescope to the sky! For very accurate tracking at high magnification and perhaps better mechanical response, many chose Polar configuration for their ETX or LX 90 telescope. Although more precise, the overall attaining of "Home Position" is also more difficult to achieve. Comparing, it takes at least three or four times longer to precisely achieve Home Position in Polar than it does in Alt-Az mode. 3) Unclamp the telescope in BOTH RA and DEC axes and move until you reach the odd position shown in Fig. 3-D1, with the eyepiece and finder UNDER the telescope! The lens end of the telescope is now pointing toward Polaris, or north; IT IS IMPORTANT THAT YOU START HERE! 4) Now clamp the telescope firmly in DEC, leaving the RA clamp loose; GENTLY rotate the RA axis and OTA COUNTERCLOCKWISE until you hit a built-in "STOP" which prevents wire winding in the base of the telescope. Keep turning until you get there....sometimes it seems like forever, but you WILL get there. If you DO NOT do this procedure, you will not be able to computer-align and you will likely damage the motor/drive unit of the telescope! 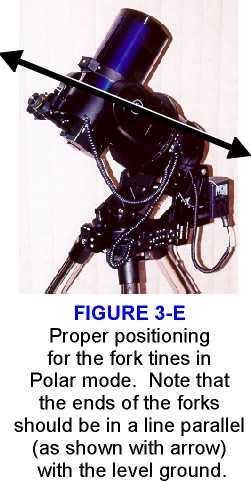 6) If the telescope's setting circle is set correctly, the reading in Figure 3-D2 (Home Position) in DEC should be "90" degrees, and the OTA should be positioned like shown, perfectly in line with the length of the two fork arms; back off and look for equal symmetry of the tube compared to one fork and you can determine very close with the eye if the OTA is slightly askew from the alignment of the fork arms. Once alignment is achieved, clamp the DEC axis securely. ALL OF #'s 1-6 CAN BE DONE PRIOR TO NIGHTFALL....THE FOLLOWING MUST BE DONE AFTER IT IS DARK ENOUGH TO SEE THE STAR POLARIS WITH THE NAKED EYE. 7) Without unlocking EITHER AXIS, move the telescope and tripod (use the fine adjustments if angles are minor or if you mount/tripod has them) until you can get POLARIS in the finderscope. DO NOT UNCLAMP! 8) Using only the slow motion controls of the tripod (AGAIN, DO NOT UNCLAMP SCOPE! ), adjust the image of Polaris until it appears in the field of view of any eyepiece that provides ABOUT ONE (1) DEGREE field of view (FOV)...this is very important for precise celestial alignment! 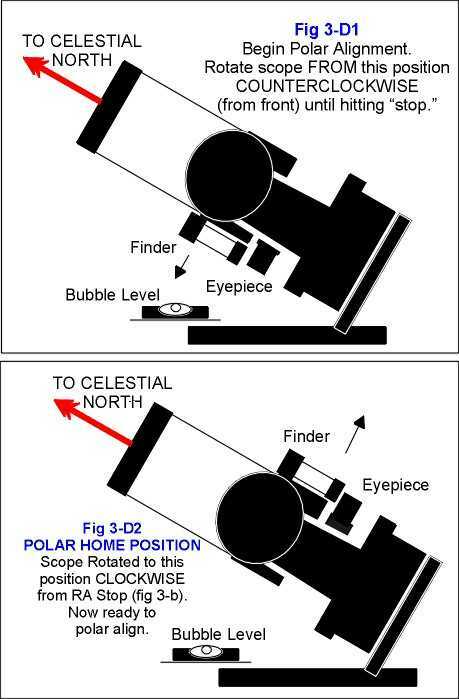 9) Once attained in a one-degree (or close) FOV you can now OFFSET Polaris in the telescope to obtain a precise celestial pole pointing....Polaris is NOT true celestial north, which is about 1 degree away; that one degree can make all the difference in the world in the accuracy of your GO TO's and in your overall sidereal tracking over long periods of time! REMEMBER THIS RULE..."True Celestial North" is about one degree FROM POLARIS in a line that extends nearly through the "end star of the little dipper handle," the second brightest star in Ursa Minor, named "Kochab." Being circumpolar, this star should always be visible even when low in winter months in the northern hemisphere. 10) Using the tripod or wedge adjustments only, you want to RAISE the telescope assembly in the eyepiece FOV until Polaris is at the very EDGE of a one-degree FOV eyepiece; now the object is to move the telescope assembly until it is offset that exact ONE DEGREE from Polaris toward Kochab. To do this, merely slowly tweak the slow motion controls of the tripod or wedge until Polaris reaches the OPPOSITE EDGE of the FOV, in a direct line toward Kochab. Once on this edge, the telescope is offset about one degree from Polaris and very close to the true celestial pole. Once you have achieved Home Position in either mode, it is time to turn on Autostar and initialize. You may think you are "home free" at this point, now that you mechanically perfect and sequentially-correctly-downloaded AutoStar ETX or LX 90 have been placed in perfect "Home Position." But you're not there....yet. You must still do the routine nightly "initializing" of the AutoStar prior to accurate alignment of the telescope. There are some pitfalls in this, just as there have been elsewhere, and some things that should NEVER be overlooked. 5) Enter today's time in LOCAL 12-HOUR TIME; set the time on AutoStar about a minute ahead and use an accurate watch to signal when to press enter. Accurate time entered is VERY important; you can download time to within 0.7 second accuracy from the WWV website: www.boulder.nist.gov/timefreq/ . It is very important that your time be within at least two minutes of accuracy for proper computer functions. 6) On the same step, you must assure that you are observing in either AM or PM (default is PM); simply used the right-left- arrow keys to move to highlight and then scroll to your choice and "Enter." 7) AutoStar then asks if you are Daylight Savings Time; scroll and select appropriate response. 8) Appearing on the AutoStar display is "SETUP: Align"; you are now ready to computer align your telescope. So far, this is right out of the book....but wait a minute....slow down. You need to check a couple of things first. Among the most embarrassing and most difficult problems to find are those that are the easiest to check. Let's make sure your settings are correct on the AutoStar!! (marked by a ">" and then "Enter" to select each item)? b) under "Mount" what about the mounting? do you have it set for whichever - Polar or Alt-Az - that you plan to use? Again, scroll to correct function and press "enter." c) now scroll to "Tracking" and check to assure that you are on SIDEREAL RATE. 2) Mode and scroll back to "SETUP/SITE"
a) Under "Site/Select" press enter and see which of your observing sites has been selected! You would be surprise how easy it is to accidentally select the WRONG site, or to forget to change from the last site you observed in....this can make a clear difference in accuracy! 3) If you have time, you also might choose to double-check your "Altitude" and "Azimuth" Percent settings (Part 2); again, I have found much success with the Azimuth Percent set to 15% and no change 01% for Altitude. Of all instructional data, Meade does a pretty good job of explaining the proper access, centering and selection of alignment stars for computer alignment in either observing mode, so that is not discussed here. There are some more "enhancement" points to ease some of your troubles however. These are yet-again some of those "easy-to-overlook" things that we forget when in a hurry. 1) Always Use TWO STAR alignment - I recommend ALWAYS using a TWO-STAR alignment, whether the "Easy" or "User-Defined"; the two-star is just as simple, requires a bit more time, but is far more precise in the long run. 2) MAKE SURE YOUR CLAMPS ARE SECURE and can hold firmly both axes while slewing; if they are loose, the AutoStar "thinks" the telescope is covering sky when it actually is slipping and standing still. c) the second star is far in the sky from the first. 4) To Choose Alternate Stars - if using "Easy" let the telescope access the star first, but do not center and do not push "Enter" if you do not want to use the star; AFTER THE BEEP, merely tap your SCROLL key (lower right) to access the next recommended star; the telescope will not move until you press "Enter;" if you do not like that star again, keep scrolling until a suitable star far away from the first is found and press "Enter." Proceed as instructed. 5) Alignment Accuracy and Using Alternate Stars - (be sure to download and print my series of AutoStar star positions and names [ www.weasner.com/etx/buyer-newuser-tips/starcharts.html ] when using "High Precision" and anytime you are using alternative stars. It is easy to not know the name of the many stars held in the AutoStar database; find those charts and print them free of charge have found that, the more alternate stars that AutoStar must select for you, the LESS accurate is the GO-TO accuracy. I do not have an explanation, but this has proved to be the case and is probably related to a time delay in the actual activation of the sidereal motor(s), since they do not commence until AFTER "Alignment Successful" shows on the AutoStar display! 6) Obvious Problems in Alignment - If you set out and see that the telescope has slewed to your first star and it is WAY off from the target star (use those charts referred to in 4) to familiarize yourself with the target stars, otherwise even "seasoned amateurs" may make an identification error!) you need to start over. Simply turn off the power, reinitialize (as described in the preceding pages), reset the scope to home position and align and star anew. Sometimes the smallest error (again "user error") can cause the greatest offsets in GO TO accuracy. If this is the case, it is best to "re-boot" and start from scratch. 7) With the new versions and downloaders for AutoStar, there is a tendency during alignment (particularly after centering the SECOND STAR and pressing "Enter") for the telescope to suddenly slew a very short and quick burst in RA (Azimuth) after beeping ; this is particularly true in Polar mode. This is NOT a problem; DO NOT re-center the alignment star but merely commence to your first "GO TO" object. This slew appears to be (although I do not have confirmation of this) an adjustment that is automatically applied by AutoStar to compensate for the time you fiddled around getting the tracking motors engaged after the final alignment! You have finally completed all the check lists....it seems like a lot of work doesn't it? Well, so did the computer your are working on right now when you first started using it. It was as strange and unfamiliar as the day is long, but look at you now. The process is automatic; you log on without consciously thinking about it, you can manipulate files, create graphics and surf the Internet without giving it a second thought. But it has not always been that way, just as it will be with the ETX or LX 90 and your AutoStar. Once all of the procedure becomes implanted firmly within you, you will have an "enhanced" telescope that will slew, track, and target with the best of them. It takes a lot of work to get there, but the freedom from frustration, the joy of accessing thousands of objects the FIRST TIME, the feeling of actually "using your telescope" instead of "working with it" (isn't that what "jobs" are for?) all combine to make this effort seem minor by comparison. Good luck as you use these tips to attain the "PERFECT-ENHANCED ETX TELESCOPE."